One mom’s take on its dangerous power. I am going to tell you a story. One about a girl who tries to have it all together. One who secretly is jealous, selfish and a perfectionist. One who tries to please everyone, at the sake of losing herself at times. This is a real story, and one that I hope will help you in facing a world where perception is everything and the real story is nothing like it appears to be. This girl is very close to me, because the person I am referring to is myself. I am a woman who fights jealousy, selfishness and perfectionism every day of my life. I have a hard time admitting these things about my inner being, but I’m only human and I have learned (the tough way), that I am not a perfect person. Trying to be perfect is like trying to fit the wrong puzzle pieces together, and as you know, it doesn’t work. What may be perfect for one person, isn’t perfect for another. As I once heard actress Amy Poehler say, “The slogan for women should be: Good for you, not for me.” That is why I am sharing my own demons in facing perfectionism, and why I try to simply be who I am: an imperfectly perfect mom, wife and human. I find myself, more times than I should, stalking through Facebook profiles, almost torturing myself looking at the moms who ‘have’ it all together. I refer to them as the ‘perfect’ moms. They are the ones who go to the best church in town, they work to show their financial independence (but they do it from home so they can be with their kids and not miss out on things), their husbands do no wrong, and while they try to passively (yet somewhat aggressively) admit they aren’t perfect, they are actually seeking out other women to say, “No, you’re the best in world. Everyone should be like YOU! !” Can you see me raging a little bit as I write this? While these moms are home multi-tasking their work and their kids, I go to the office to work and simply focus on my job. While they are playing with their kids and teaching them the alphabet, I find myself trying to do laundry or write, while my kids play with their toys (or my phone). “I am failing them,” is what I repeat to myself as I think about those moms who are spending all their time enjoying their kids, while I long for the moment that I can just write or read my phone. The reason I am sharing this insight is to show the poison of what perfectionism can bring out in a person. I fight these terrible thoughts and start second guessing my parenting ability. I put blame on myself for not spending 100% quality time with kids, and I grow jealous as I watch these mom’s embrace their kids while they work (they can do it all apparently). I digress, because it’s not them who sound like they’re wrong, it’s me. Unfortunately, we know a lot more about each other now than people did years ago. I can’t tell you how many women have said to me, “I am so happy I didn’t have Facebook when my kids were young.” I agree with them, and secretly long for the days where all my cell phone was capable of doing was texting and calling. Now that we “see” so much more about people’s lives, we can’t live in our own bubble where ‘ignorance is bliss’ anymore. That is why perfectionism is part of our world now more than ever. As I once heard, perception is reality, and for anyone that has social media, you know what I mean. The best piece of advice that I can give is to take a break from social media, and to focus on what matters. Long before people posted about their everyday life, people just simply lived in the moment. We have to let go of what others portray, and their ‘reality’ of perfection, because it is the reality they chose to show us. No one gives us a pure 100% glimpse into their world, nor should they want or need to. All we can do is ‘like’ or ‘love’ what they choose to show, because we will never know what is truly going on behind their smiles. 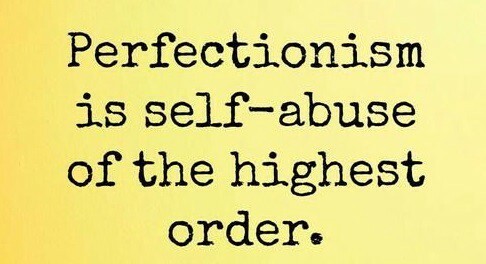 Perfectionism is a dangerous power, but one that we can control if we don’t let it in our lives in the first place. We are all imperfect beings who make mistakes and aren’t always the best we can be at times. However, life is about learning and growing from the errors of our ways. Life’s a beautiful adventure; one that is meant to be lived and not measured by the likes of others on social media. When I start to feel the pangs of perfectionism course through me, I know that I immediately have to change my train of thought. I think of my hobbies, and which positive outlets I can utilize to take my mind off of these intrusive effects. My first choice is to write, and just let everything out on paper. I let myself type away, and somehow, the pain and frustrations start to fade away in the distance. The negative voices and constant racing thoughts begin to stop spinning, and I can finally catch my breath and rightfully take my thoughts over again. Writing has been my therapy for so many things, and I cannot reiterate enough how sharing my inner most demons has guided me through some of my most difficult battles. Another outlet that has helped me, has been to become more active and involved in working out or a sport related endeavor. I have been an avid golfer most of my life. Golf is like an old friend who I could always count on being there for me. Its presence has been instrumental in keeping my mind focused and occupied away from intruding, and negative, thoughts. I also hit the gym or take a nice walk to clear my head. Exercise increases endorphins, and endorphins are known for their ability to make you happy and naturally energized. What better way to get over the blues of perfection, than by working on your own physical and emotional health. You will not only feel better, but your worries about being ‘perfect’ will just become another passing thought; one that will not be allowed to stay for long.